Throngs of people and horn honking traffic. The echoing call to prayer from the many minarets across the city. 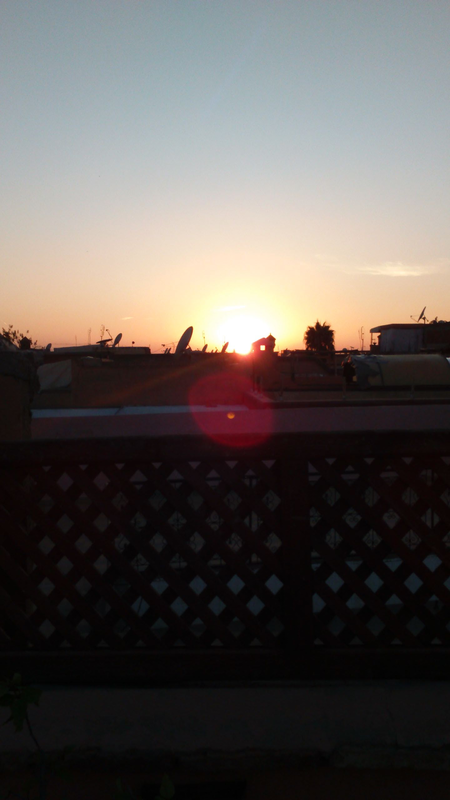 Watching the sunset from the rooftop terrace of my riad in Marrakech. This is what I love about travelling. This North African treat is just waiting for you to explore it. Check out the Ryanair website for deals to Morocco over the midterm and see for yourself what all the fuss is about. Our lovely French host from the Riad Mandalay met us on the Rue de la Kasbah at the mouth of the maze of streets and back lanes. Luckily, because upon arrival it seemed overwhelming and inevitable that we would get lost, within minutes, like token tourists. A left, another left?, past a wide street with kids playing football, a right and another right, I think, or was it a left?, brought us to a laneway and a large, dark, studded wooden door. Our panicked expressions relaying our momentary fear that we had fallen foul of some glaringly obvious tourist trap were soon allayed as we were ushered into a stunning tiled courtyard oasis. My first experience of a riad was a beautiful one. The small turquoise pool nestled amongst large potted ferns and relaxing cushioned seating areas drew the eye upwards past three balconied floors to the draped white fabric shielding those below from the heat of the sun. I would never have imagined this beauty lay hidden behind the walls of the dusty laneway outside. The rooftop terrace provides ample opportunity to soak in the atmosphere and the sunsets and even catch a daytime freckle! Google sourced photo of the courtyard at Riad Mandalay. We were led to our rooms to unpack and coo at the stunning polished stone shower (I still think about this shower!) in the bathroom and crisp cool four poster wrought iron beds. A good location from which to explore the Kasbah and a 30 minute walk to Jemaa el Fna square and the souks. We had two full days in Marrakech and that was time enough to rack up fitbit steps! Get lost in the souks we were told, go check out the tanneries we heard, try snacks in Jemaa el Fnaa in the evening as you soak up the hustle and bustle of the square, we read. Alright Marrakech, you’re on! Wearing traditional costume in the square. I caught a sneaky photo. They want you to pay though. No trip to Marrakech would be complete without a wander around the souks, oh and accidentally ending up at the tanneries. Thankfully it was a Berber holiday so the usual hive of activity was instead a quiet, smelly vista of dye pits. Thank goodness for the mint we were given to put under our noses. I still managed to bring the smell of camel hide home with me in the form of a rather expensive and as yet unusable camel leather bag. Don’t get me wrong, I love the bag. I do not love the smell that emanates from it and grows stronger by the day despite my best efforts to de-smellify it. Word of warning, camel leather stinks to high heaven. Don’t say, ‘era it will be grand after a while.’ I am still waiting, a year later for the smell to go! The offending camel bag I have yet to use. Might I also add, a chador clad woman in Jemaa el Fna could accost you, grip your wrist and start to cover your hand with henna, despite your extreme insistence that you would rather remain henna less. She will expect €30 for her troubles, despite you having said to her repeatedly that you had no money on you and she will leave you with a henna ‘tat’ for days. Maybe that just happened to me! Sigh, one day I too shall own a door like this. A bite to eat in Marrakech was served at Bazaar Cafe and their tapas menu was delicious! It was tricky to find without trusty google maps as it was on the other side of the square to our riad but well worth the trek. Terrace seating and they serve alcohol, in case you were wondering! If tagines are still on your list I’m sorry I can’t recommend any tagine serving restaurants as we were all tagine-d out by the time we got back to Marrakech from Essaouira! It was rugby 6 nations time during our visit and a trip to Kechmara to watch the match was needed. Plenty of expats and tasty cocktails on offer here. We got a cab from the square and it was about €2 each. Cheap as chips. At that I think we were overcharged but we weren’t complaining. We did hear that there is a rate for locals and a rate for tourists. I don’t think I made that up. It is worth checking out the going taxi rates and seeing what you can expect to be charged versus what you can haggle drivers down to. We ate at Restaurant Loft after watching the match and the food, while more European, was grand. Familiar fare on offer at reasonable prices. Our last day of exploring in Marrakech took in the Bahia Palace, with its stunning tile floors and painted doorways and ceilings. The intricate carvings and green gardens inspire tranquility and awe and show how illustrious and decadent this place must have been in its heyday compared to the flurry and bustle outside the walls. Another palace, that I am told evokes memories of Alhambra in Granada, is the El Badi Palace. Complete with nesting storks and impressive building work. The four gardens for four wives was an interesting sight and while it was under renovation it was still open for visitors. Peeking out is one of the four large, sunken gardens. While we didn’t spot as many cats as in Essaouira, I did spy this little guy down a laneway on our last day and couldn’t help but feel he symbolised how I felt in Marrakech. So small and insignificant amidst all the lives, mazes and history in the city. Daily routines had gone on long before I ever arrived and would continue to do so long after I left. This little guy. Get lost in the city but don’t lose yourself. Next Post Essaouira and all the cats. All of them.